Born in 1979, Caoimhín grew up listening to old vinyls of The Chieftains, Planxty and The Bothy Band. He started playing fiddle at the age of 10, also learning the uilleann pipes, flute and whistle. He worked at the Irish Traditional Music Archives for a number of years, immersing himself in old recordings of Willie Clancy, Denis Murphy, Paddy Cronin and Seamus Ennis. In 2003 he released Kitty Lie Over to great acclaim with uilleann piper Mick O'Brien. Chosen as No.1 Traditional Album of 2003 by Earle Hitchner in the Irish Echo, and described in The Irish Times as "a niftier mood enhancer than any drug therapy" by Siobhán Long, this has become one of the all-time best-loved traditional music albums. 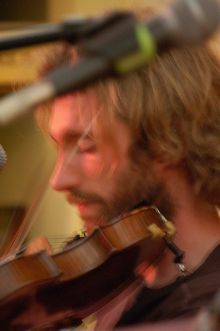 Caoimhín has been the subject of numerous television documentaries, including Faoi Lán Cheoil, where he had the Oscar-winning actor Jeremy Irons as his fiddle student over the space of a year. As well as playing traditional music, Caoimhín writes weird and wonderful new music. His 2007 EP Where the One-Eyed Man is King gained him a whole new audience, leading to him being featured on the cover of the Journal of Music, full page interviews in the Irish Times and the Irish Independent, live broadcasts of concerts on Lyric FM's John Kelly Ensemble and all sorts of other wonderful things. He has recently been commissioned to write music for a major play at the Abbey Theatre in Dublin, and had an entire new solo show commissioned by the Project Arts Centre in Dublin.